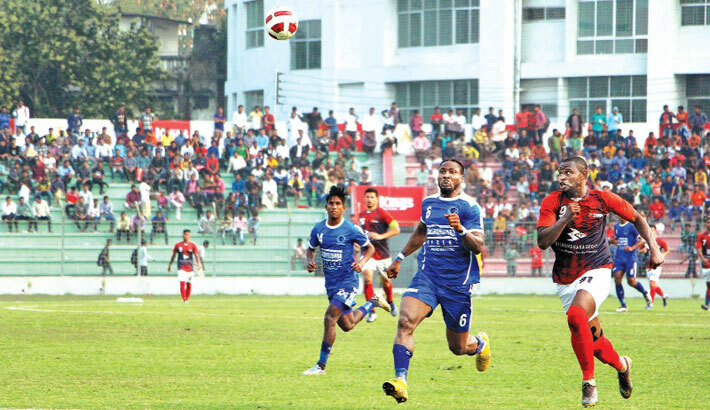 Bashundhara Kings reclaimed the apex spot of Bangladesh Premier League (BPL) 2018-2019 points table as they managed to edge past Sheikh Russel Krira Chakra by 1-0 goals at Sheikh Kamal Stadium in Nilphamari on Tuesday. Bashundhara Kings Brazilian forward Marcos Vinicius scored the decider for his team to allow Bashundhara Kings to take back the top-spot after Dhaka Abahani went atop in their last match. Kings Head Coach Oscar Bruzon stuck to his strategy of proactive play against the defensive mastermind of Bangladesh, Sheikh Russel Krira Chakra Head Coach Saiful Bari Titu. Titu on the other hand followed his much despised yet successful strategy of going in the shell against stronger opponents. His plan proved to be quite successful early in the match as Bashundhara Kings World Cupper Daniel Colindres failed to break into Sheikh Russel defence line despite repeated efforts in the initial stages of the match. Experienced campaigner for Bashundhara Kings Emon Mahmud was very near to scoring the lead on the 9th minute of the match as he took control of a free-kick from Baktiyar Duyshobekov. Sheikh Russel defenders, in a rare mistake, failed to clear the ball as Emon tried to dribble past a Sheikh Russel defender which cost him precious moments and eventually his underpowered shot couldn’t evade the Russel defenders. Sheikh Russel went on the counter attack on the 23rd minute led by their local gem Md Khalekuzzaman who sprinted though the left wing with Russel prized recruits Alisher Azizov and Udoka Alison in centre and right wing respectively. Khalekuzzaman angled into the Russel D-box but could not control the pace of the ball which hindered his chances of taking a shot prompting him to send off a cross. The cross was also superb but Alison who was stationed at the right edge of the post couldn’t head the cross as Bashundhara Kings defenders cleared the ball. But Magician Marcos proved why Kings were the worthy winners of the encounter with the goal of the league so far with a stunning bicycle kick on the 57th minute courtesy of a well-placed pass from fellow forward Mohammad Ibrahim. The sensational goal gave Bashundhara King their top-spot back as they held on to their unbeaten streak with 8 wins and draw so far in the tournament. Kings have amassed 25 points from 9 matches while Dhaka Abahani have 24 points to their name despite playing a match more than Bashundhara Kings. On the other matches of the day, Arambagh Kria Sangha were held to 1-1 goal draw by Rahmatganj Muslim Friends Society while Brothers Union thrashed Bangladesh Muktijoddha Sangshad Krira Chakra by 3-0 goals.